Perfectly located near public facilities and services such as restaurants, cafes and popular commercial areas such as Uncalı Street are a short distance from this complex, private hospitals and government clinics, such as Uncalı Hospital, about 1.5 Km away from the complex, 250 meters from the nearest public transport stop, 3.8 Km from the popular Antalya Migros Mall and 2.6 km from the famous Konyaalti beach. The luxurious residential complex consists of 7 residential buildings each has 3 storeys with a total of 56 apartments, all available apartments have an area of 220 square meters consist of 4 large bedrooms and a living room with a separate kitchen, 2 bathrooms and 2 balconies. 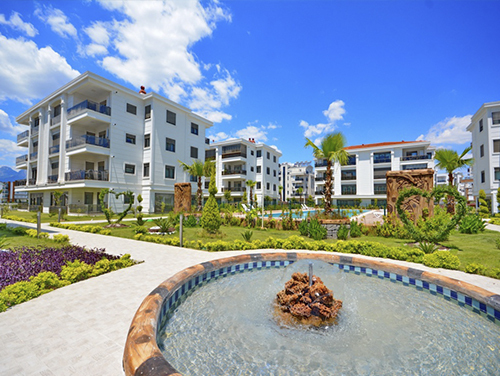 Each apartment is prepared with high standard specifications as air conditioning in each room, central heating system, wooden flooring, spacious kitchen with modern design equipped with oven, stove, air filter and microwave within the selling price, Interphone with video display and contact system with the guards. The compound is fully equipped with social amenities such as large gardens, sports fields, playgrounds, backup generator, modern lighting within the complex garden and general cleaning service.